After graduating from Boston University with a degree in sculpture, Christine Peters moved to Maine in 1995. With limited space to create, she turned to sculpture on a smaller scale and began making wearable art. 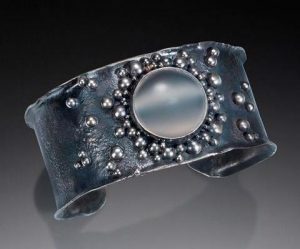 Balancing her time between fine craft shows and production in her home/studio in Damariscotta, Christine creates one of a kind pieces in silver, gold, precious and semi-precious stones.